Our winter warmer weekend event will take place on Saturday 26th & Sunday 27th January. Escape the cold and pop into any of our 3 branches to enjoy some hot soup and a roll whilst you browse our selection of new and pre-owned caravans for sale. We have some great savings and offers available. 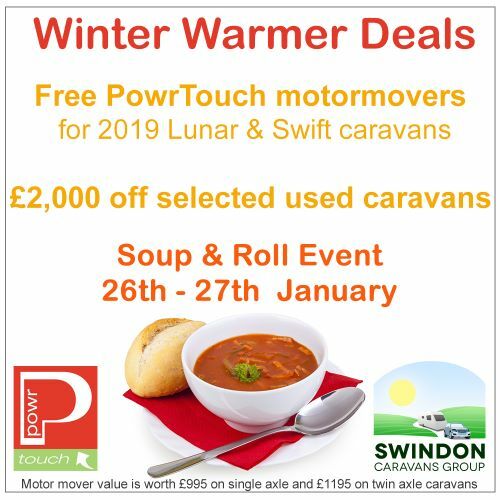 Purchase a 2019 Swift or Lunar caravan and receive a FREE Powrtouch motormover. This offer will apply to all models including our Swift Vogue dealer special (also includes Eccles, Sprite, Challenger, Elegance & Elegance Grande models on Swift and Clubman, Delta, Lexon, Stellar, Quasar, Ariva & Venus on Lunar). If you have a certain model in mind then please check availability with the relevant branch before travelling. Secure the best availability on your new 2019 Swift & Lunar now before the NEC Caravan Show starts. Receive expert advice from our sales teams to help you find a caravan to suit your requirements. Up to £2,000 off selected used caravans across all 3 branches. All used caravans over £7,000 still come with either a free accessory kit or £500 vouchers that can be spent on any product or service across the Swindon Caravans Group. 10% off accessories in the shop (excludes awnings, TVs & gas). £50 off our price on a new Kampa Awning.